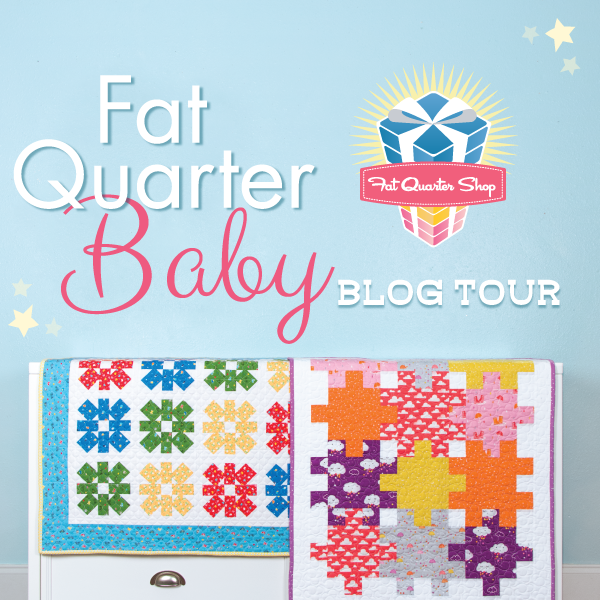 Welcome to my stop on the Fat Quarter Baby blog tour! 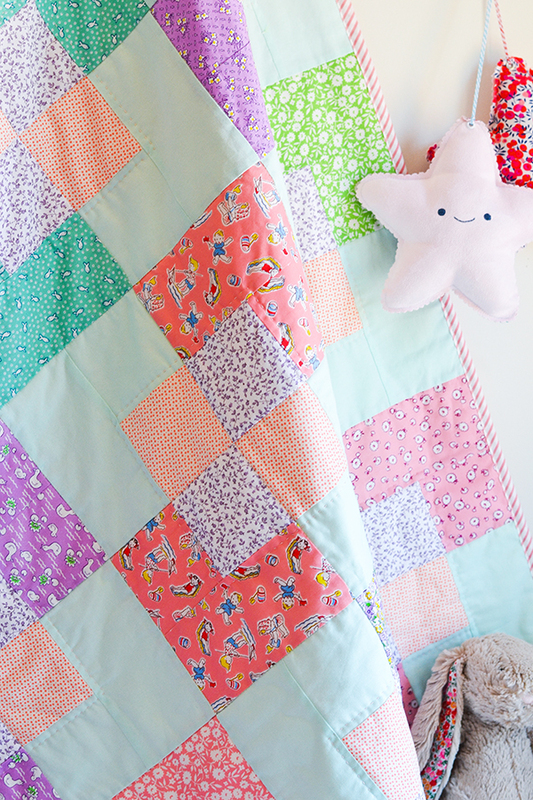 This week we are celebrating the release of Fat Quarter Shop's latest book, 'Fat Quarter Baby', which is full of 20 adorable baby quilt designs. The quilt I was assigned is called 'Ryan'. 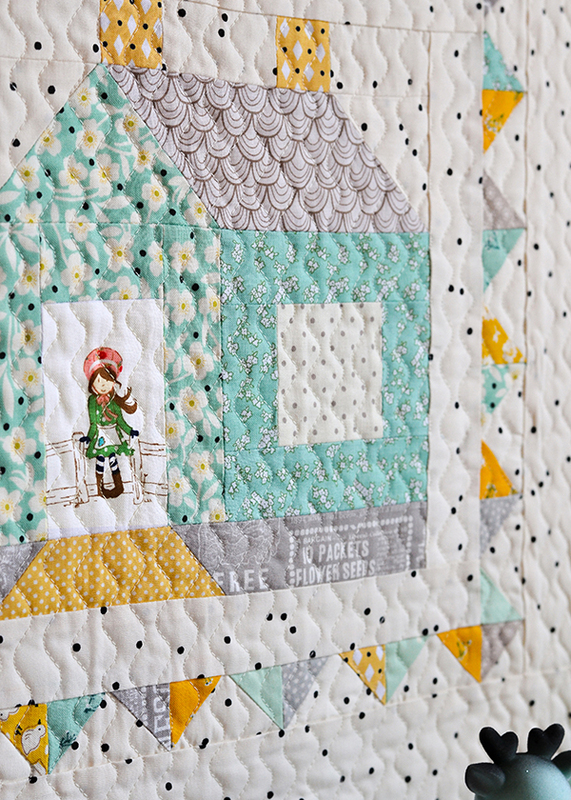 The book has 10 girl and 10 boy quilt designs, though truth be told a lot of the patterns are unisex so depending on your fabric choices can be made for a boy or a girl. 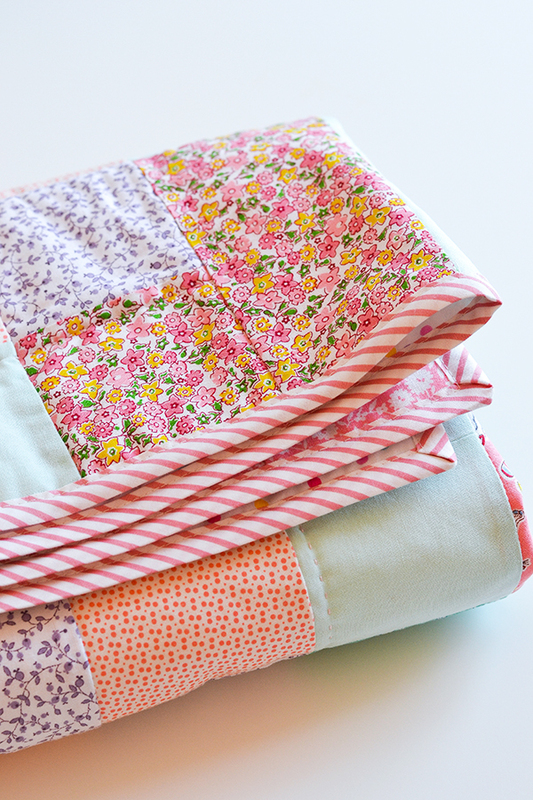 I chose feminine fabrics for my quilt, so it's a girl's quilt! 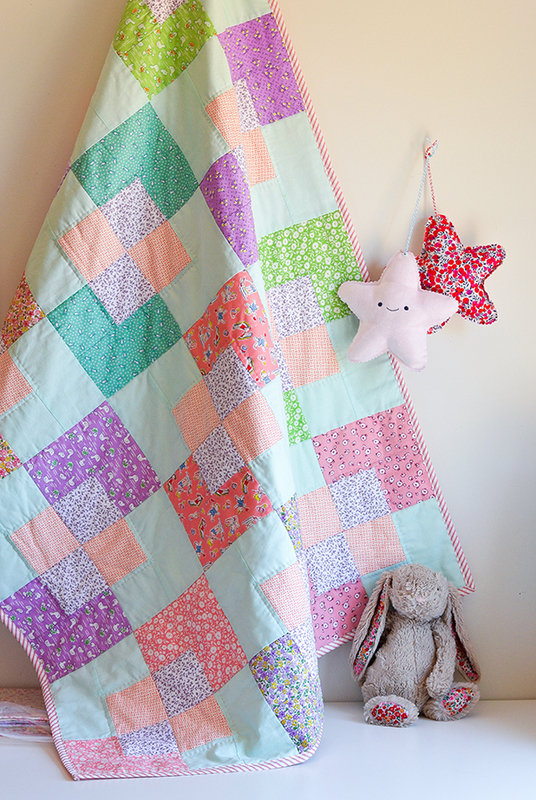 Most of the fabrics I used in this quilt are from Windham Fabrics 'Nostalgia Storybook Vacation' range. 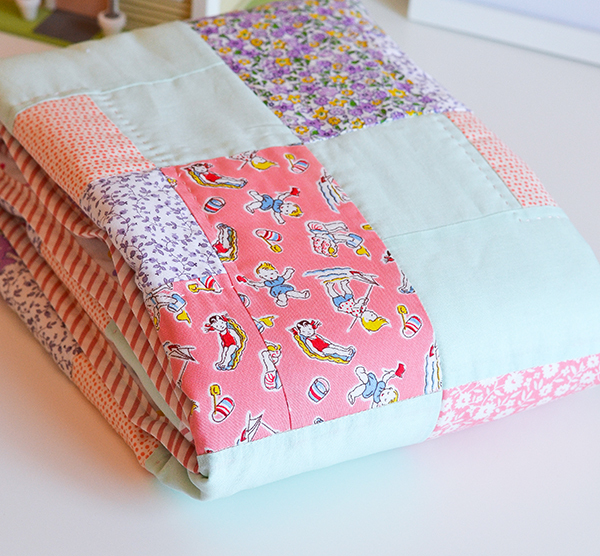 Sweetest repro designs, which I have paired with a mint solid cotton. 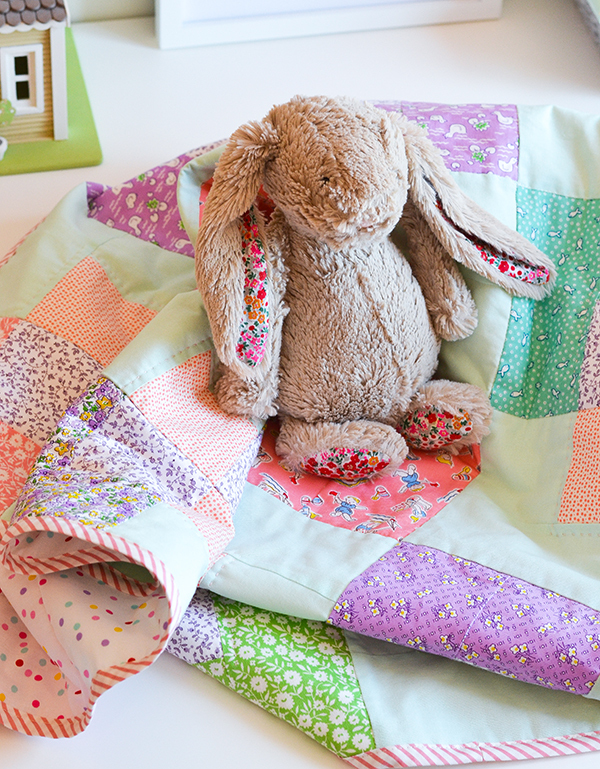 This quilt is very beginner friendly, with large blocks, so the quilt top comes together really quickly. For quilting, I first machine quilted in the ditch between the squares, in a grid pattern. 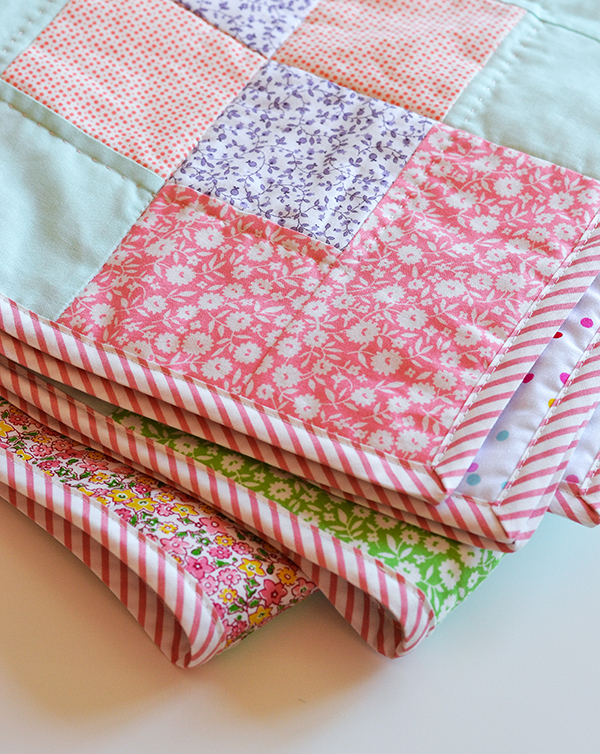 Then I added some hand-quilting around the centre of each block to add a little bit of that sweet vintage 'squishy' feel. 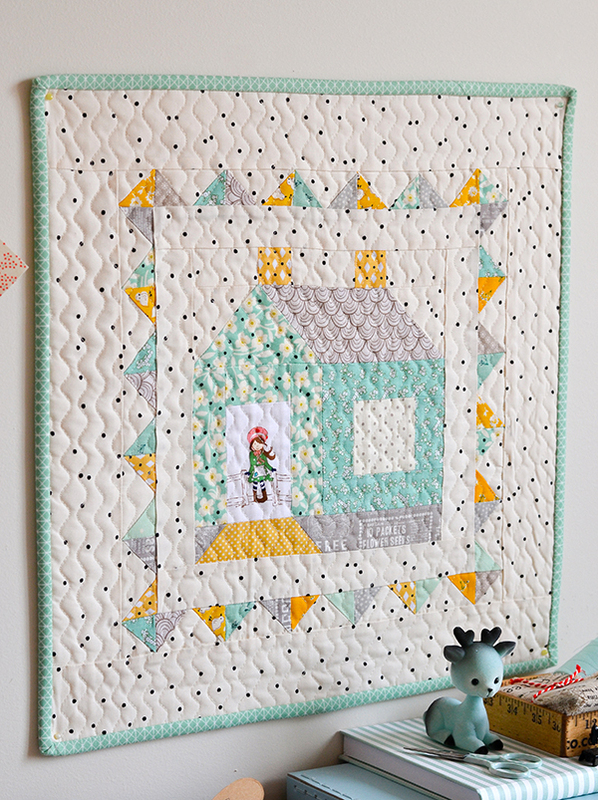 If you would like to see the other quilts in the book pop over to Fat Quarter Shop's blog Jolly Jabber, and also visit the other bloggers taking part in the blog tour to see their quilts. Thank you for stopping by today! 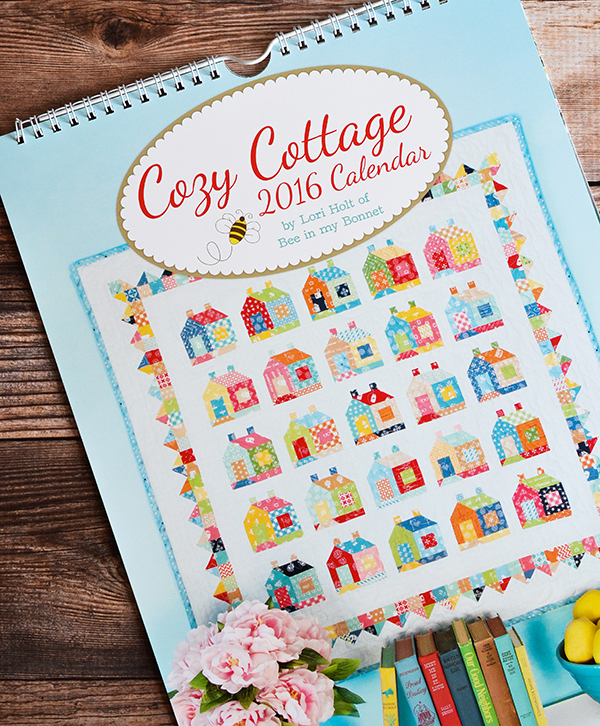 Have you guys seen the new 2016 Cozy Cottage Calendar by Lori Holt of Bee in my Bonnet? 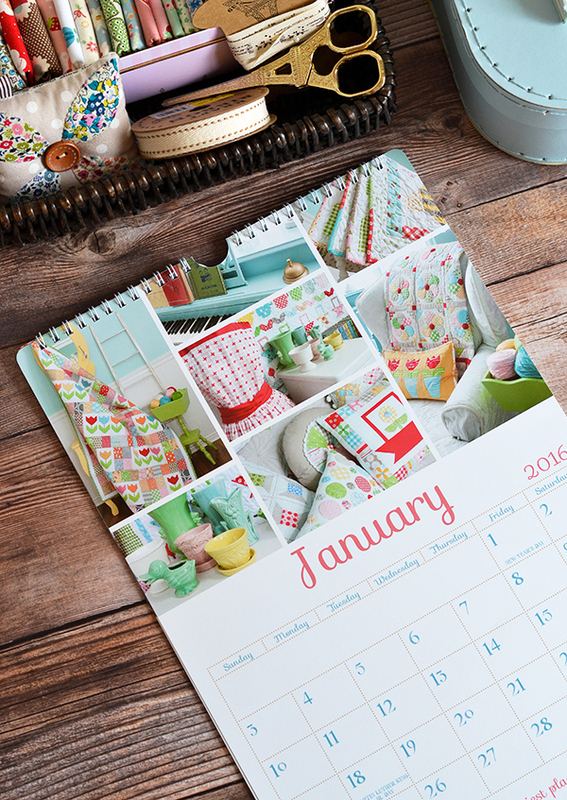 It's a monthly calendar with each page featuring beautiful photos taken inside Lori's own vintage style cozy cottage in Utah, decorated with colourful quilts and other projects from her books. 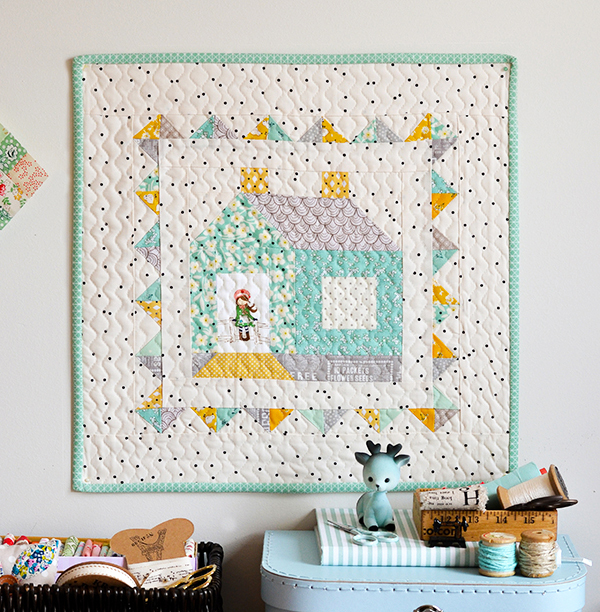 As if the calendar is not pretty enough it also comes with patterns for the Cozy Cottage Block, Cozy Cottage Mini Quilt, and Cozy Cottage Pillow. 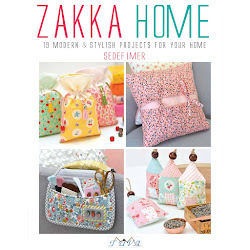 The book's cover shows the mini-quilt - so dang cute. These patterns are not available to purchase elsewhere, and it's a limited collection calendar (just saying). 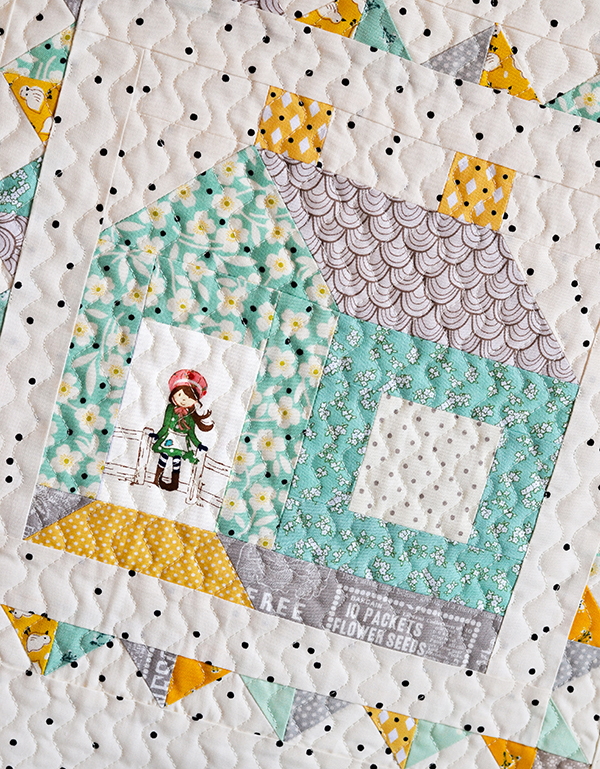 As one of the bloggers taking part in the blog tour to celebrate the calendar's launch, I decided to make the Cozy Cottage Pillow-mini (a mini quilt version of the pillow pattern). 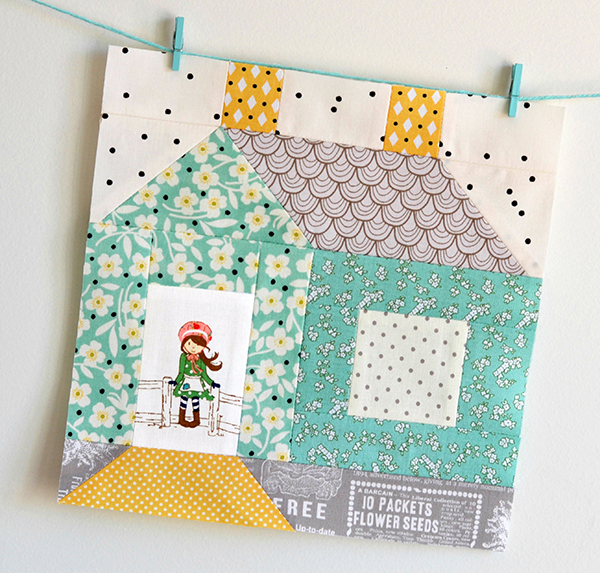 I started by making an 8" Cozy Cottage block. 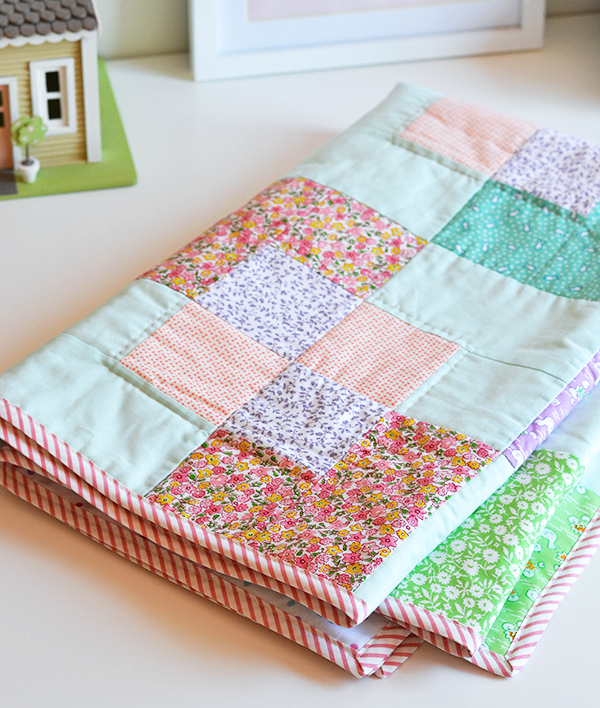 I then added the borders, leaving the pillow backing out, and finished it as a mini quilt to add to the growing collection of minis on my sewing room wall. For the quilting I used a decorative stitch that I recently discovered on my machine. 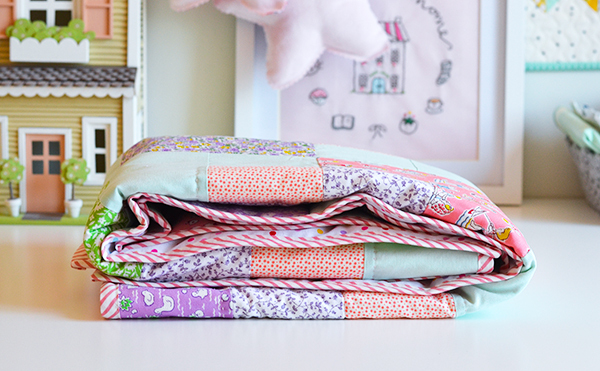 I raved about it on Instagram when I shared a picture of another quilt, and there was so much interest that I wanted to recap it here as well. It's a wavy stitch (stitch #19 on my Janome Horizon Memorycraft 7700 QCP and #20 on my entry level Janome DC2050). I set the stitch length and wave width to the highest possible settings to get the biggest waves. I marked a single quilting line down the centre of the quilt and quilted outwards from that mark. Then turned the quilt around and quilted outwards in the other direction. I didn't mark any other quilting lines other than that first one down the middle - I just lined up the edge of my foot with the peaks of the previous line. The distance between the peaks is close enough that you can traverse from one peak to the next quite easily without actually having a marked line to follow. I didn't try to get parallel wavy lines as I like the more organic look of random waves, which to me looks a bit like free motion quilting at first glance. But if you wanted parallel lines you would have to pay attention to your needle's position when you start each 'wibbly wobbly' line. Back to the matter in hand, I can't wait to start using my new calendar - it will be so lovely to look at Lori's beautiful makes for inspiration every day. 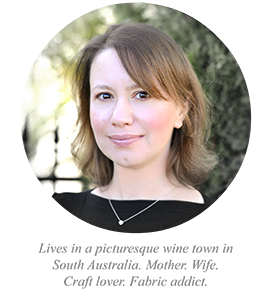 And look here - I have a very special event marked in my calendar already - I will be at the market!